Hi ya’ll! Hope you had a good weekend! Ours was rather busy… a little too busy for my liking, but that is how it flows this time of year. I am just trying to make it through this next week as we have something after work EACH night and after that it should be smooth sailing into the holidays. 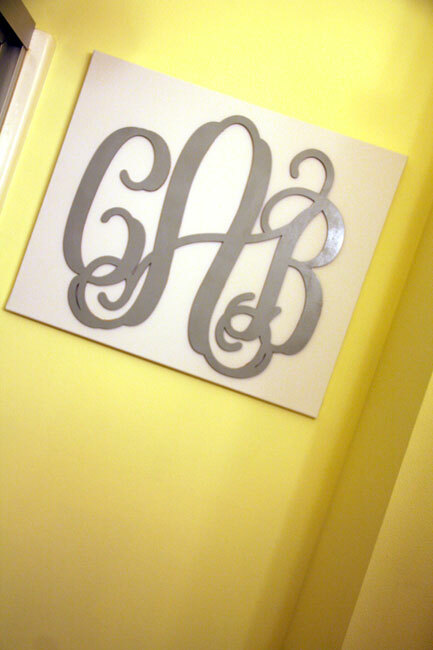 So, today I thought I would share with you another project from our Master Bathroom, the monogrammed canvas that I finally finished and had Brian hang in the bathroom. It turned out way beyond any expectation I had and was one of my easier decorating projects! 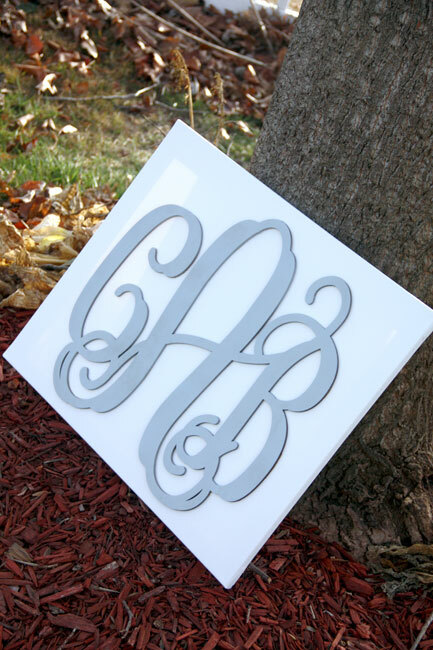 I got my idea for this from a blog called Dixie Delights, she is in love with these wooden monograms in all sizes and flaunts them throughout her home in all sorts of ways. 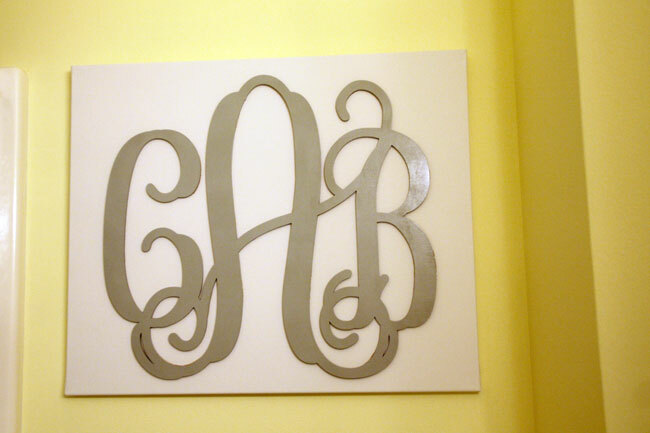 I really wanted something to fill the wall on the side of the shower in our bathroom and I knew one of these large wooden monograms on a canvas would be perfect! The bathroom is painted in a soft yellow and since our Master Bedroom duvet cover is yellow and white stripes with gray and white striped sheets under, I knew I wanted to bring the gray/whites/yellows into the bathroom with a touch of a darker purple, such as an eggplant color. I am planning to put hooks below this canvas for bath towels instead of a traditional towel rack. I need to do a little research on where I want to purchase these hooks, I know Pottery Barn will carry them, BUT I would like to see if I can find them a little cheaper somewhere if I’ll just make it into another DIY project. You will want to measure your wall to see what size canvas will fit on the wall. 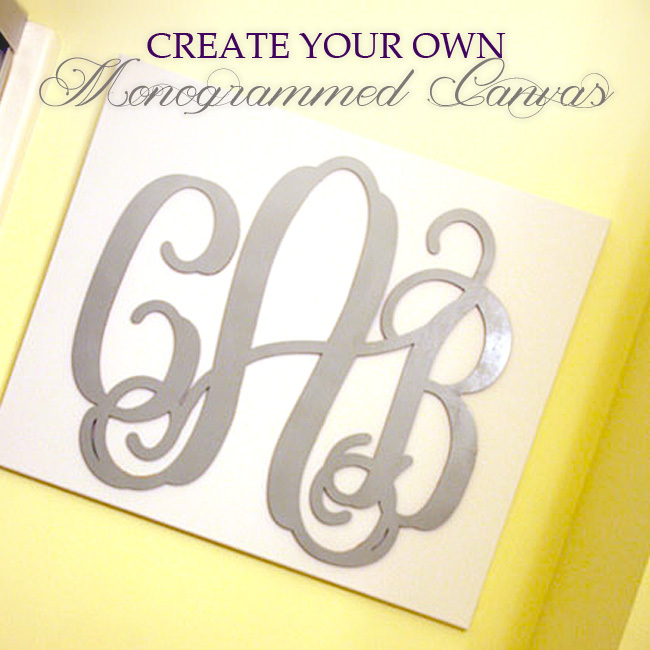 Then, you’ll want to order a wooden monogram that will fit within the space on your canvas. 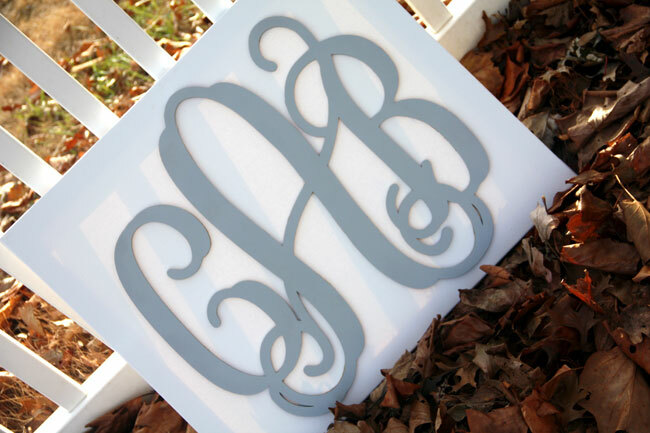 For this project, I ordered a three letter wooden monogrammed canvas from Southern Proper Monograms. 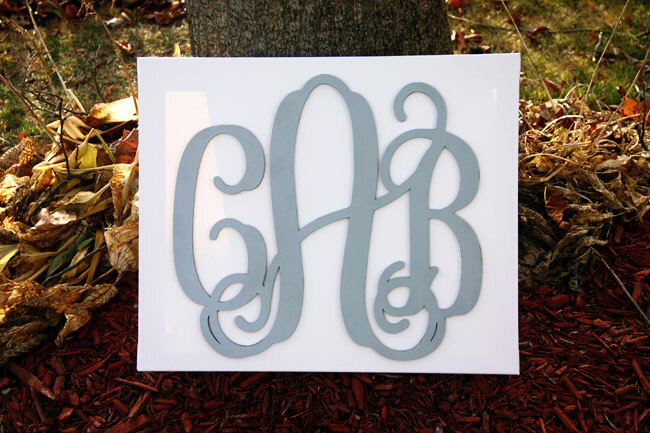 After receiving the wooden monogram and oo’ing and ah’ing over it, I took it outside and sprayed it with light gray spray paint (two coats) and let it dry. 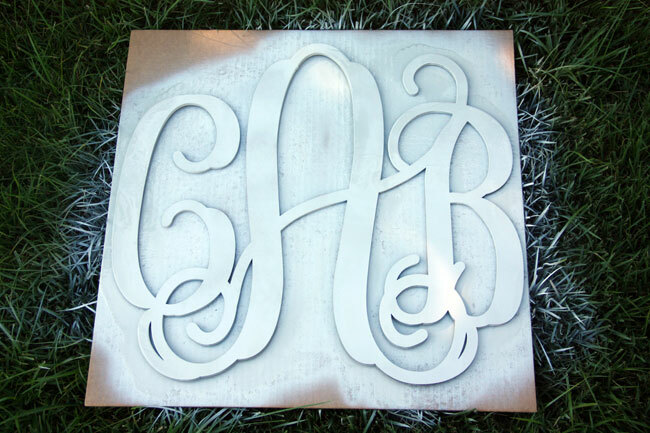 Here is a photo of the letters after the first coat of spray paint. 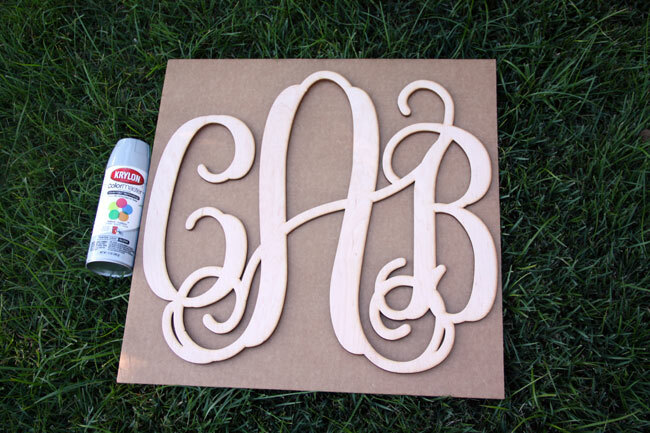 After the spray paint drys, you’ll want to use a fabric glue and apply glue to the entire back side of the wooden monogram. Then, you’ll place it on the canvas and let it dry for 24 hours. If a couple of areas don’t dry flat, you can use a hot glue gun to flatten those areas down, but you shouldn’t need to do this in more then a few spots. Here is one more photo of the canvas outside… can you tell I took these photos before we got covered in snow? I really cannot believe how easy this project was… now, if I can get myself going on finding some towel hooks to hang below it, I’ll be a happy camper. I’ll be sure to share my adventure on that and a few other decorating ideas I have for the Master Bathroom. 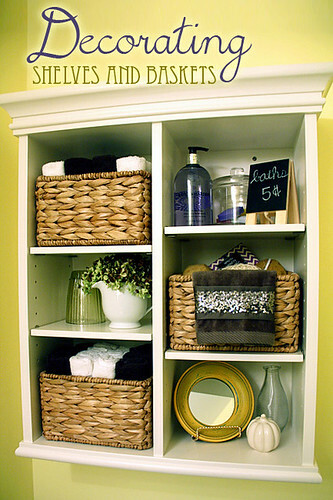 Also, if you have been reading my blog for awhile, let me share with you the Pottery Barn cabinet with baskets that I decorated a couple months ago for the bathroom, I continue to be pleased with this area in the bathroom… I still plan to buy a basket for the top of the toilet and some decorations to go in it as well. See my post about Decorating Shelves and Baskets HERE.